A wall damaged by an Aberdeen City Council van has been repaired – almost a year after the incident. Donald Trump has announced he will declare a national emergency to fulfil his pledge to construct a wall along the US-Mexico border. President Donald Trump has said a wall is a wall as he berated allies for trying to redefine his planned defence on the Mexican border as a barrier. 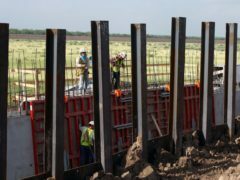 President Donald Trump has insisted congressional negotiators working on a compromise border security deal include money for his proposed wall between Mexico and the southern US border. Donald Trump has urged people to use the phrase “Build a wall and crime will fall” with regards to his proposed wall between the US and Mexico. A border wall between the US and Mexico will harm endangered plants and animals and cause trouble for the growing ecotourism industry in Texas, scientists say. An 11-year-old boy has been taken to hospital after part of wall collapsed at an Aberdeen school this morning. Council co-leader Jenny Laing has said the authority had shown a “clear failing” on the Wellington Brae repair scandal on the eve of a crunch meeting into the issue. The SNP has claimed an investigation into public money spent on a wall belonging to the family of a former councillor raise “more questions than answers”. Aberdeen's former finance convener believes a row over a £200,000 repair to a wall belonging to his dad in the run-up to the election was a "smear campaign" from the SNP. A legal graffiti wall has been created in an Aberdeen park. The SNP's group leader said he has been left "stunned" after councillors narrowly voted against recovering costs from the owner of a wall at the centre of a repair bill row. A report into the handling of land at the centre of a £200,000 wall repair bill row will be considered by councillors on Wednesday. A senior Aberdeen councillor has confirmed he sold the land at the centre of a £200,000 wall repair bill row to his dad. An Aberdeen councillor at the centre of a £200,000 wall repair row has said he feels "let down" by the local authority. The SNP group in Aberdeen has contacted Audit Scotland asking it to intervene in the £200,000 Wellington Brae wall repair row. The SNP has called for an independent investigation into a row over £200,000 worth of work to a wall - which it says is owned by a councillor's family. Can’t decide what colour to paint your room? Why not pick them all! If you've ever had an issue picking a colour for the feature wall in your house, one creative oil worker may have found a solution.